Today's NavNet TZT14 has come a long way from the first multi function display. Take one look and you will see just how far. A generous 14.1" display with edge-to-edge glass makes for a clean and stylish installation. The LED backlighting pushes light through every pixel on the screen for remarkable brightness. Anti-reflective glass coating is visible under any lighting condition. 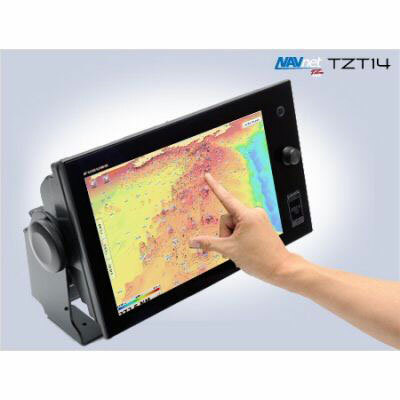 Configure the displays with a wide variety of sensors to build a navigation suite that meets your individual requirements. To make operation even easier while underway, adjustments such as range and gain are easily made from either the on-screen touch menu or our patented RotoKey™.